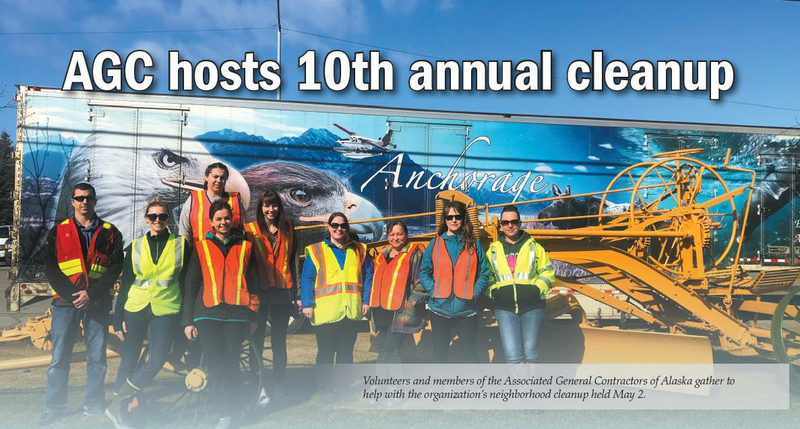 For the past decade, the Associated General Contractors of Alaska has hosted a cleanup day in its Schoon Street neighborhood. The cleanup encompasses every street between Dimond Boulevard and 76th Avenue, a five-block stretch. The cleanup event not only improves the look of the neighborhood, it also allows businesses that work in the area to get together and network. Organizers knock on each door in the cleanup area to boost participation. The event coincides with the Anchorage Chamber of Commerce’s citywide cleanup. This year’s event was held on May 2. After several hours spent picking up trash and filling AGC’s dumpster, participants were treated to an AGC-sponsored barbecue that included “every kind of grilled dog you can imagine,” along with brisket and other barbecue favorites. This gave participants additional time to network with other nearby businesses and talk about community issues. While the real winner of the cleanup event is the city and residents of Anchorage, one of the participants walked home with an unexpected win — a $100 bill that he found during the event!